Treats by day…terror by night…enjoy family-friendly activities during the day and if you‘re brave enough…stay for the slay. 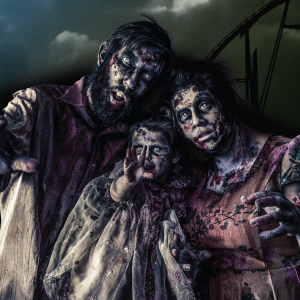 See how the park is transformed into a fun AND frightening site filled with all sorts of screams and scares around the corner…including specialized food and drink offerings. 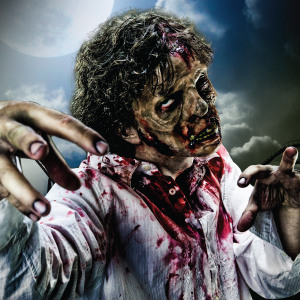 The exhilarating encounters of Halloween Horrors begin on September 29th and last through October 28th. Pumpkin Decorating – Noon-5pm, Shelter A (Red Pavillion) Pumpkins for sale to decorate! Trick or Treat Train – 4:00-5:00pm-4p, Kiddieland and South Train Stops, Don't miss Kings & Princesses handing out candy! A frightening experience serving up surprises around every door. Each time through the Funhouse is never the same for just like ghosts…the scares move around and are never in the same place. 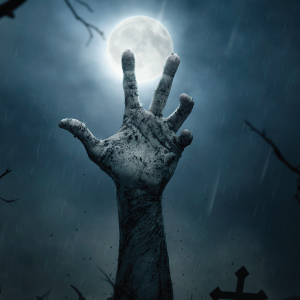 Prepare for a haunt like none other as you never know what or who will be lurking around the corner. Zombies are everywhere, especially by the Lost Coaster. It’s so toxic...and the zombies are looking for their next meal. Your worst nightmares are coming alive with a series of terrifying rooms. Can you make it through this nightmare? Start your experience off by facing life or death choices in the Boiler Room. Make your way through the blood thirty clowns in the Revenge of the Clowns. Remember your worst nightmares? Experience the Boogie Man Room, where the monster is not hiding under the bed, he is already inside of you. Next up is the Arachnophobia Maze Room…it’s just you and thousands of hungry spiders. Are you scared of swamp monsters? Wade through and never know what is going to pop out. Are you Claustrophobic? It might be a little tight but take a stroll thru this room. In the Exorcism Room, the spirits are not welcoming here, they are out for revenge…with YOU. If you are still with us, keep strolling and arrive upon the Nuthouse…where the insanity will take you over and you might just find yourself as the next patient. Dolls are coming to life and they will stop at nothing to get you in the Doll Room. Last but certainly not least…walk into the Woods room…where the dark is the perfect place for the unknown to come for you and your soul. VooDoo on the Bayou - Located below the RoofTop Lounge…a terrifying area known for witch doctors who may be looking for their next pirate victims. They keep the heads of all of their victims...we'd hate to see yours with them. CarnEvil FearGrounds - Located in front of the castle. Clowns take over the grounds and they hate trespassers. ChemiKill-Zombie Containment Zone - Zombies are everywhere, especially by the Lost Coaster. It’s so toxic...and the zombies are looking for their next meal. Ride availability will be limited during the event with our most popular rides open during the day. Rides will begin to close as haunted attractions are opened. Open to the public 8:00pm to 11:00pm - $3 per person. September through October, join in and decorate your tent! Saturday, October 13th prizes will be awarded for 1st, 2nd and 3rd place. 9:00am - Play Monster BINGO...if you dare! 10:00am - Make your own Monster during Monster Crafts. 11:00am - Pop on in and make yourself a Ghoul. 12:00pm - Come and join us for a spin on the classic Pumpkin Decorating. 1:00pm - If you’re brave...face a trick or a treat during Face Painting Activity. 2:00pm - The Witch’s Scavenger Hunt...be prepared to use your brain power! 4:30pm - Ghouls and Gals come dress to impress for the Annual Costume Contest. Age Groups: Infant-2 yrs., 3-5 yrs., 6-8 yrs., 9-12 yrs., 13-18 yrs. and adults. 6:00pm - The festivities continue so get your treats and don’t be tricked (Trick or Treating). 8:00pm - Trail down the road of darkness to the bath house in Section E for the Glowing Ghostly Golf Cart Parade. 9:00pm - End the night at the Pavilion, for screams, terror and dancing to a DJ. You better move and groove until your bones fall off.